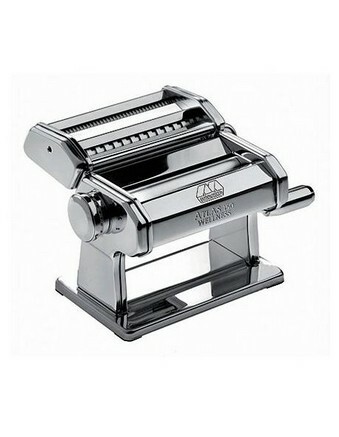 Take advantage of tastier and healthier homemade pasta with the MARCATO Swiss Pasta Machine Silver. This innovative machine comes with three attachments to make your own flat pasta sheets like lasagne or ravioli, thin strips for spaghetti or tagliatelle, and wide strips for fettuccini. Experiment with buckwheat flour or whole wheat flour for healthy alternatives. Proudly Italian made, this chrome-plated steel pasta maker lasts a lifetime and comes with an easy-to-follow instruction booklet to help you start making your own pasta as soon as possible.